An undercover investigation at Iron Maiden Hog Farm in Owensboro, Ky., recently exposed not only the horrific conditions pigs endure at factory farms, and the gruesome practices they claim will keep pigs healthy. Secret film footage (view the footage below) taken earlier this year by an investigator working for the Humane Society of the United States (HSUS) reveals that after 900 piglets died from diarrheal disease in a 2 day period, their intestines were ground up into “a smoothie” and fed to their mothers and other sows. Kentucky state law prohibits the feeding of dead pigs to pigs, and for good reason. In addition to these inhumane conditions, the sows were then forced to consume remains from diseased piglets, just one of several disturbing practices HSUS officials say are fairly widespread within the industrial sector of the pig industry. “The entire atmosphere at this facility is awful for animals, many of whom are perpetually immobilized and suffering from body sores, diarrhea attacks and prolapsed uteruses,” said Paul Shapiro, vice president of farm animal protection at HSUS, in a press release. The Humane Society said it believes the practice is prohibited by state and federal law banning feeding animals “unprocessed waste” including meat products. The industry, with the support of some animal care experts, says it’s a scientific and veterinarian-approved way of humanely dealing with PEDV. Without it, claims The Center for Food Integrity’s Animal Care Review Panel, even more pigs would die. “There’s no question that people may be put off by this treatment, but PEDV is wreaking havoc out there on the farms and ‘feedback’ is the only control method we have found to be effective,” said Dr. Tom Burkgren, executive director of the American Association of Swine Veterinarians. Maybe not creating the inhumane and unnatural conditions that bred the disease would be a better place to start? I’s hard to see how feeding living animals the diseased flesh from dead animals could be allowed by the FDA and USDA. Then again, both agencies find it totally acceptable to feed chicken poop to cows. Although we can’t count on the government to address these practices through regulation reform, pressure from consumers continues to be successful in creating change at the other end of the supply chain. 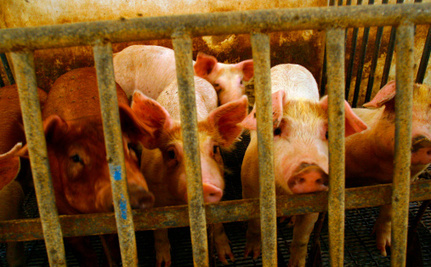 More than 60 major food companies—McDonald’s, Safeway, Costco, Target and dozens more—have mandated that their pork providers eliminate the crates from within their supply chains. Additionally, major pork producers including Smithfield, Tyson and Cargill are moving away from gestation crates. Please sign and share the petition to urge the USDA to ban Iron Maiden and all farms from feeding dead piglets to their own mothers. Disgusting treatment and inhumane. These factory farms need the chop they are abhorrent dens of iniquity. I don't care what anyone tries to tell me. Thanks for posting this sad tale.